Gets a red blush when completely ripe. Beautiful flower display in early spring. Self-pollinating and Superb pollinator for other varieties Japanese plums. 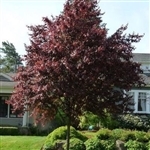 In summer, this variety yields sweet, purple-red plums; in spring, it offers white, fragrant flowers; and in fall and winter, the tree offers structural interest and a great place to hang holiday lights. Leaves are red, making it an attractive landscape plant. Vigorous, heat-tolerant and disease-resistant. Fruit ripens JUNE.